Dear Evan Hansen (Touring) is On Tour! Dear Evan Hansen is a stage musical with music and lyrics by Benj Pasek and Justin Paul, and a book by Steven Levenson.The musical opened on Broadway at the Music Box Theatre in December 2016, after its world premiere at the Arena Stage in Washington, DC, in July 2015 and an Off-Broadway production in March to May 2016. The titular character, Evan Hansen, is a high school senior with severe social anxiety, which inhibits his ability to connect with other people and make friends. After the death of one of his classmates, he fabricates a lie that inadvertently brings him closer to the classmate's family, while also allowing him to gain his own sense of purpose. The musical has received critical acclaim, particularly for Ben Platt's leading performance, the lyrics, and the book, and has served as a touchstone for discussion about pre-mature storytelling and themes explored in musical theatre, particularly that of mental illness and youth suicide. At the 71st Tony Awards, it was nominated for nine awards, winning six, including Best Musical, Best Score, Best Actor in a Musical for Platt, and Best Featured Actress in a Musical for Rachel Bay Jones. Evan Hansen is a teenager who struggles with severe social anxiety which makes it hard for him to make friends. His therapist recommends that he write letters to himself detailing what will be good about each day. Before the first day of his senior year in high school, his mother, Heidi, suggests that he makes new friends by asking people to sign the cast on his arm, which he broke by falling out of a tree over the summer. Across town, the wealthy Murphy family — Cynthia, Larry, and their children Zoe and Connor — sit down to breakfast. Zoe and Larry berate Connor for getting high before school, while Cynthia struggles with the fact that her family is falling apart. The two mothers wonder simultaneously how to connect with their sons ("Anybody Have a Map?"). At school, Evan runs into Alana, a smart classmate, and Jared, the son of a family friend and the closest thing Evan has to an actual friend. Both Alana and Jared notice his broken arm, but neither signs his cast- instead, Jared teases Evan about it. Jared and Evan then run into Connor, whom Jared pokes fun at. Connor interprets Evan's awkwardness as making fun of him, resulting in Connor pushing Evan to the ground. Connor's sister Zoe, whom Evan has a massive crush on, feels obligated to apologize for her brother's behavior. Evan wonders if this is his destiny – to be ignored and an outcast, never getting the girl of his dreams; "on the outside always looking in" for the rest of his life ("Waving Through A Window"). Evan writes himself another letter. He states he has given up on it being a good year and how he wonders if anyone would notice if he were not there. He remarks that all his hope is now pinned on Zoe, since his crush on her is the only thing that brings him happiness. While printing the letter in the school's computer lab, he encounters Connor again, now much more subdued than he was in the morning. Connor asks what happened to Evan's arm and offers to sign his cast, musing that maybe now they can both pretend they have friends. After signing the cast, he reads Evan's letter (which he grabbed from the printer as a favor) and becomes furious at the mention of Zoe, thinking Evan intended for him to see the letter in order to make fun of him. He storms out, taking the letter with him. Several days pass with no sign of Connor. Evan is in an intense state of anxiety over what Connor might have done with the letter, and tells Jared online about his assignment to write letters to himself, and how he's worried about what Connor might've done with the letter. Jared remarks that Connor has always been completely out of his mind. Later that day, Evan is called to the principal's office, where Connor's parents are waiting to meet him. They tell Evan that Connor died by suicide a few days before with Evan's letter in his pocket. Believing it to be Connor's suicide note addressed to Evan, they ask Evan if he and Connor were close, as Connor had never mentioned having friends before. Not wanting to further their grief and unsure what to do, Evan agrees to go to their house to talk about Connor. There, after seeing Cynthia's distress over the loss of her son, Evan panics and, rather than telling the truth, begins to fabricate an intricate story of his and Connor's friendship, claiming he and Connor kept up a secret email correspondence and recounting a fictional version of the day he broke his arm in which Connor was with him ("For Forever"). Later, Heidi reminds Evan that he needs to begin applying for college scholarships. She mentions hearing about Connor's death, but Evan tells her not to worry and that he didn't know Connor. Seeing Connor's name signed on his cast, Heidi confronts Evan, but he lies, saying that someone else named Connor signed it. After realizing he needs evidence of his supposed "secret email account," Evan enlists Jared's help in creating fake, backdated email conversations between himself and Connor ("Sincerely, Me"). After Evan shows the Murphy family Connor's 'emails', Cynthia is ecstatic that her son had a friend, but Larry is more hurt that Connor took his family and his privileged life for granted; Zoe, who was alienated by Connor's aggressive behavior, refuses to mourn him at all ("Requiem"). However, after reading the suicide note, Zoe notices that she is mentioned and asks Evan why Connor would say that about her; Evan, unable to tell her the truth, tells her all the reasons he loves her under the guise of Connor saying them ("If I Could Tell Her"). Overcome with emotion, he impulsively kisses Zoe, but she pulls away and tells him to leave. At school, Evan and Alana notice that people are starting to forget about Connor. Spurred on by a vision of Connor, Evan enlists Alana and Jared's help in founding "The Connor Project" — an organization dedicated to keeping Connor's memory alive. The three pitch the idea to the Murphys, who agree to support the project ("Disappear"); moved by his dedication, Cynthia gives Evan a necktie she had gotten for Connor that he had never worn, and asks Evan to wear it when he speaks at Connor's memorial service. At the official launch of The Connor Project, Evan gives an inspiring speech about his loneliness and friendship with Connor, which goes viral. Zoe, overcome by the impact her brother and Evan have had, kisses him ("You Will Be Found"). Evan and Alana pitch a fundraising idea on The Connor Project's website. In memory of Connor, they want to raise $50,000 in three weeks to reopen the abandoned apple orchard that Evan and Connor supposedly spent time in. Despite Alana's total devotion the project, Evan becomes preoccupied with his new relationship with Zoe and his newfound family in the Murphys, and begins to neglect his mother, Jared, and The Connor Project ("Sincerely, Me (Reprise)"). Heidi tells Evan that she saw the video of his speech on Facebook and asks him why he did not tell her about The Connor Project or about his and Connor's friendship. He angrily responds that he did not have the time because she is never around. Overcome with emotion, he then rushes off to the Murphys', telling her that he is going to Jared's. At the Murphys', Evan bonds with Larry Murphy and confides in him that his father left when he was young, has remarried, and no longer keeps in touch with him or Heidi. Larry offers him an old baseball glove of Connors' that was never used ("To Break in a Glove"). Sometime later, at Evan's house, Evan makes an offhand comment to Zoe about how he and his mother do not have much money and he needs scholarships to pay for college. When he begins to mention Connor, Zoe tells him that she does not want their relationship to be about Connor, but about the two of them ("Only Us"). Evan gets into a fight with Jared, who claims that Connor's death was the best thing that ever happened to Evan – he is no longer invisible and has landed the girl of his dreams. Later on, Evan goes to the Murphys', only to discover that they have invited Heidi for dinner. Heidi, who has no idea that Evan had spent time at the Murphys', is mortified when Larry and Cynthia offer to use the money that they had set aside for Connor's college fund to send Evan to school instead. After returning home, Heidi and Evan fight over his secrecy and deception. When Heidi proclaims that the Murphys are not Evan's family, Evan confesses that he feels not only welcomed but also accepted by the Murphys in light of Heidi's absence and expectations towards Evan's mental health. Heidi tearfully berates him for running off to his new family, while Alana begins to find inconsistencies in the fake emails Evan "received" from Connor and suspects that the entire story is a lie. Beginning to panic, Evan urges Jared to help him clear up the inaccuracies, but Jared refuses due to Evan's own absence. Evan counters that Jared himself had acted as a friend to him only when he needed something from him. Jared threatens to expose Evan, and Evan warns him he could, in turn, open up about Jared's role in the lie. Heidi, Alana, and Jared converge in Evan's conscience, compounding his guilt and doubt over his decisions ("Good for You"). Evan decides he has to come clean with what he has done. Imaginary Connor attempts to talk him out of it, citing the happiness he has given the Murphys and the fate of Evan's relationship with Zoe, but Evan does not back down, angrily shouting that he needs the whole thing to be over. Connor is unconvinced and asks Evan how he broke his arm: did he fall by accident or actually let go? Evan denies suicidal intent, but Connor tells him that if he tells the truth, all he has will be gone, and the only thing he will be left with is himself. He disappears, leaving Evan alone. Evan goes to apologize to Alana, but she says she has given up on Evan helping her with The Connor Project. She doubts the truth of Evan's repeated statements that he was Connor's best friend, since they were never seen together, and she says that it is easy to create fake backdated emails. Desperate, Evan says he has proof that they were friends. He shows her the letter to himself that he wrote when he was giving up on having a good year, claiming it to be Connor's suicide note. Realizing that the letter is the key to fulfilling the fundraising goal, Alana posts it online where, to Evan's chagrin, it goes viral. As a result, many people begin to believe Connor's suicide was because of his uncaring, wealthy parents. Evan is distraught and goes to see the Murphys, who have become the targets of hateful comments from people who believe they were responsible for Connor's death. He walks in on the three of them fighting about why Connor really killed himself and finally admits that he fabricated the entire thing, hopeful that he could forge a genuine bond with the Murphys out of the tragedy. As Zoe and her mother tearfully run out, Larry turns away from Evan in disgust. Alone once more, Evan absorbs his perceived brokenness as inescapable ("Words Fail"). Evan finds Heidi waiting for him at home. She saw the letter online, and immediately knew that it was one of Evan's therapy assignments. She apologizes to Evan for not seeing how badly he had been hurting, though Evan denies her guilt due to his deception. He then vaguely admits that his fall was a suicide attempt. Heidi sits him down and recalls the day that his father moved out: how she felt so small and alone and did not know how she was going to make it by herself. In the end, however, she realized that she was not alone – she had Evan and knew that the two of them could make it through anything so long as they were together. Tearfully, Heidi promises that she will always be there for him when he needs her ("So Big/So Small"). A year later, Evan is still living at home and working at Pottery Barn to earn enough money to go to college the next semester. He contacts Zoe, whom he has not seen since the day she found out the truth, and asks if she will agree to meet him. She does, but insists that they meet at the orchard that has been reopened in Connor's memory. He apologizes for the pain he caused her family and admits that he has been reading Connor's ten favorite books after finding a list in an old yearbook in an attempt to connect with who he really was. He also thanks her and her parents for keeping his secret and reveals that they never told anyone else that his friendship with Connor was a lie. She forgives him, saying the whole ordeal brought her family closer together over the past year because "everyone needed it for something." Evan asks her why she insisted on meeting at the orchard, and she replies that she wanted to be sure he saw it, and the two share a gentle moment before they part. Evan mentally writes himself one last letter reflecting on the impact he has had on his community and finally accepts himself ("Finale"). Evan Hansen – A high school senior who struggles with severe social anxiety. He is assigned by his therapist to write letters to himself about why each day will be good, which becomes the catalyst for the plot of the story. He also has never had any friends, and has had a crush on Zoe Murphy for a very long time. After Connor's death, he begins to tell lies of him being friends with Connor to the Murphy family because they found Evan's letter to himself folded up in Connor's pocket; they thought Connor wrote it to Evan. The first act centers on his outreach propelled by Connor's death, while the second act has him unleash his yearning towards the Murphys and his anger towards Heidi and Jared, who he believes have used him for validation and ignored him when they didn't need him. Heidi Hansen – Evan's mother, a nurse's aide who attends paralegal school at night, often leaving Evan on his own as a result. She tries to connect with Evan, but struggles because she doesn't personally understand what he goes through on a daily basis. Having been left by her ex-husband years prior to raise Evan on her own, she exhibits possessive and jealous behavior once she learns of the Murphys' interest in securing Evan's future. However, she comes to see her failings and Evan's concealed sorrow as a wake-up-call not to hide from her son. Zoe Murphy – Connor's younger sister and Evan's longtime crush. She was never close to Connor, hated him even, but wishes she had known him better and turns to Evan after he lies and says he was friends with Connor. She is initially mad at Evan when he comes clean about the lies, but eventually forgives him. Cynthia Murphy – Connor and Zoe's stay-at-home mother. She is constantly trying to keep her fragile family from falling apart, but is often unsuccessful. She clings to the memory of Connor even though she was never close with him, and her relationship with Larry and Zoe suffers because of it. The second act elaborates on her past attempts at coaxing Connor through expensive retreats, and her bitterness towards her husband's distance. Larry Murphy – Connor and Zoe's busy father. He works hard to give his family a relatively easy life, but he is emotionally distant from all three of them. He becomes close with Evan, who never had a strong father figure, and begins to see Evan as the son Connor never was. However, as the letter becomes public, he's faced with his role in Connor's alienation and the truth behind Evan's outreach. Connor Murphy - A high school senior who is also a social outcast with no friends, like Evan. He is a frequent drug user, and becomes aggressive when he is high. He is very protective of his sister Zoe, even though they are not close. He commits suicide early on, but his image returns in Evan's imagination to guide him. Evan's imaginary version of Connor is likable, contributing to Evan's belief that they could have been friends. His death is the basis of the whole story. Alana Beck – Evan's precocious and sometimes insufferable classmate. She is constantly looking for academic and extracurricular activities to boost her collegiate chances. She never knew Connor, but is greatly affected by his death and the concept of mortality, and quickly joins Evan in founding the Connor Project in order to keep Connor's memory alive. An original Broadway cast album was released at midnight on February 3, 2017. The second song on the album, "Waving Through A Window", was released as a special early download for those who had pre-ordered the album. The fifth song, "Requiem", was made available to stream for 24 hours on January 26, 2017, a week before the release of the cast recording. The song was released as a second pre-order bonus the next day. The recording of the Act 1 finale "You Will Be Found" was available for a first listen online on January 30, 2017. The cast album debuted at number 8 on the February 25 Billboard 200. The cast album became available in compact disc format on February 24, 2017. The cast album, produced by Alex Lacamoire, featuring the band from both the original Off-Broadway and Broadway productions, including Ben Cohn (piano), Jamie Eblen (drums), Justin Goldner and Dillon Kondor (guitars), Rob Jost (bass), Justin Smith, Todd Low and Adele Stein (strings) and won the 2018 Grammy Award for Best Musical Theater Album. The musical opened Off-Broadway at the Second Stage Theater on March 26, 2016, in previews, with the official opening on May 1. The cast featured Ben Platt, Laura Dreyfuss, Mike Faist, Rachel Bay Jones, Will Roland and Jennifer Laura Thompson repeating their roles from the Arena Stage production. New cast members were John Dossett and Kristolyn Lloyd. Michael Greif again directed, with choreography by Danny Mefford. The Off-Broadway engagement closed on May 29, 2016. The show premiered on Broadway on November 14, 2016, in previews, and officially opened on December 4. After originally announcing that performances would take place at the Belasco Theatre, in mid-September 2016, producers announced that the show would instead be performed at the Music Box Theatre. Michael Park, who originated the role of Larry in the Arena Stage production, returned for the Broadway production (replacing John Dossett who went on to the musical War Paint). All other cast members from the Second Stage production returned for the Broadway engagement. Ben Platt played his last performance on November 19, 2017. Noah Galvin replaced Platt on November 21, 2017 and played until February 2018. Taylor Trensch played two performances in the show before officially replacing Galvin on February 6, 2018. A U.S. Tour was announced, starring Ben Levi Ross in the title role. It will also star Jessica Phillips in the role of Heidi Hansen, Jared Goldsmith in the role of Jared Kleinman, and Phoebe Koyabe in the role of Alana Beck. Also joining the cast will be Christiane Noll in the role of Cynthia Murphy, Aaron Lazar as Larry Murphy, Marrick Smith in the role of Connor Murphy, and Maggie Mckenna in the role of Zoe Murphy. The tour will start in Denver in October 2018 and will go on to play more than fifty cities. The show will play its first international performance in Toronto, Canada. The production is slated to begin performances in March 2019. Derek Mong, in his review of the musical at the Arena Stage, wrote that the "inventive set design by David Korins...that transforms a small stage into a platform for the most intimate living room where a mother and son share a heart-to-heart to the physical abyss of internet cyberspace... book by Steven Levenson... lyrics and music by Benj Pasek and Justin Paul... heartfelt lyrics with universal appeal joined by the perfect, oftentimes acoustic, accompaniment that can change the mood from somber to celebratory to sinister in a single bar of music. "Barbara Mackay in reviewing the Arena Stage production for TheatreMania wrote: "Levenson, Pasek, and Paul set themselves two high, untraditional bars in Evan Hansen: exploring a community's grief and examining a lonely protagonist who desperately wants to connect with that community... Ben Platt is outstanding as Evan... Since the success of the musical depends entirely on whether Evan's solitary nature appears funny or weird, Evan's ability to laugh at himself and make the audience laugh is crucial. Platt is charming as he eternally twists his shirt tails and hangs his head... Although the themes of grief and loneliness are serious, the musical is anything but somber. It addresses challenging facts of life. But from start to finish, when Evan leaves his room and finds an authentic life outside it, Dear Evan Hansen contains far more joy than sadness. "Susan Davidson, in her review of the Arena Stage production for CurtainUp, noted: "...it helps to suspend the disbelief that sullen, anti-social teenagers can change quickly. Surely that's a process requiring time-released hormonal adjustments. It is hard to accept that a long-admired-from-afar girl can change Evan's outlook on life so rapidly or that Connor's teenage disequilibrium leads him to do what he does. Coming through loud and clear, however, is the fact that what starts as deceit can be blown totally out of proportion by the Internet where lies are disseminated with lightning speed leaving plenty of victims in their wake...The music is pleasant, not terribly original but good enough to get toes tapping. Benj Pasek and Justin Paul's ballads stand out, particularly Heidi's "So Big/So Small," Evan's "Words Fail" and Zoe and Evan's young sweethearts duet "Only Us. ""Charles Isherwood, in his review of the Second Stage production for The New York Times, noted: "The songs, by Benj Pasek and Justin Paul (Dogfight, A Christmas Story), strike the same complex notes, with shapely, heartfelt lyrics that expose the tensions and conflicts that Connor's death and Evan's involvement cause in both families. The music, played by a small but excellent band on a platform upstage, is appealingly unstrident pop-rock, with generous doses of acoustic guitar, keyboards and strings. It's the finest, most emotionally resonant score yet from this promising young songwriting team. 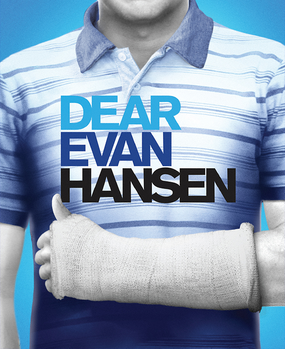 "Dear Evan Hansen is a recipient of the Edgerton Foundation New Play Award. The musical was adapted into a young adult novel by actor and singer-songwriter Val Emmich, in collaboration with Pasek & Paul and Levenson. The novel, which will also feature additional material based on scenes and songs cut from the show's development that flesh out and expand upon the story, will be released by Little, Brown Books for Young Readers on October 9, 2018. Levenson, Steven; Pasek, Benj; Paul, Justin (2017). Dear Evan Hansen. Theatre Communications Group. 144pp. ISBN 978-1559365604. Dear Evan Hansen (Touring) has no reviews.